I was a little late jumping on the Big Shot Textured Impressions Embossing Folders bandwagon. My “gonna be hot” intuition isn’t especially well-tuned and I actually get it wrong quite often. I’ll see something – of course, it’s going to be something that I absolutely love – and I’ll be convinced that the rest of the world (read here “My Customers”) will be crazy about it. Case in point: there was a hostess set a couple of years ago with a gorgeous rooster. The less said about that stamp set, the better. 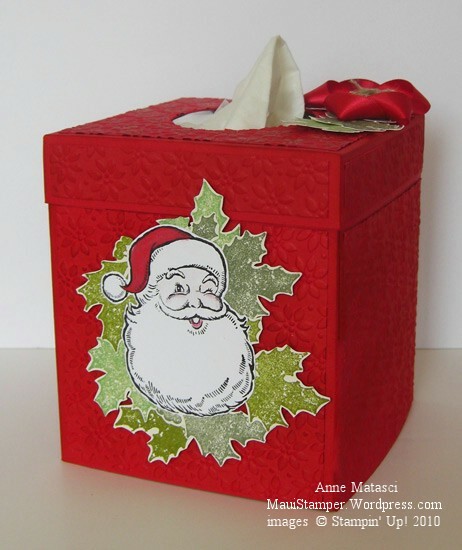 There’s a great tutorial for this project at Splitcoaststampers and it was very easy to follow. I want to point out that when I say Kleenex box, that is what I mean: this is the genuine article, not Brand X. The tutorial dimensions are for a Kleenex brand box, so if you use another brand be sure to check your dimensions. And pay attention when the instructions tell you to sponge the edges of the box and across the embossing – it matters. Just imagine how dull this would be without all of that Textured Impressions Embossing. What WAS I thinking?? This is just beautiful. What a great job you did! This is so cute. I have a fall one that I’m giving to a dear friend who is 92, I know she’ll love this one too. 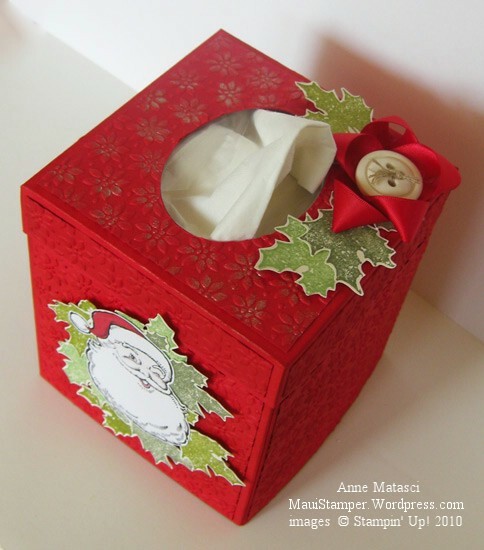 Love the Kleenex box, Anne! So festive! You are hysterical- and not alone! I didn’t buy it at first either, but I have it now. And I haven’t used it, but I will totally have to make this. This is really cute! Thanks for sharing where to find the tutorial. I’m glad I’m not alone – sometimes I think I have a defective gene when it comes to picking out stuff that will be popular. Oh well, at least I recognize when it’s a hit and play catch up! I used a retired Stampin’ Up! tool to cut the oval – I’m sorry! The Big Shot dies usually have multiple sizes on one die and as a result they won’t cut a single oval. The best alternative I can suggest is tracing an oval shape and cutting it out with scissors. Update!! You can use a Sizzlet for this purpose! There are a number of Sizzlets with a single shape that will work quite well – I’ve just tried it with the Scallop Clearlit and it worked beautifully. Your box is wonderful. And your christmas’father is so funny ! I love it.